I don't think of myself as a landscape photographer, but every once in awhile I'll see a stunning vista, and I somehow manage to capture not just the view, but the feeling of having been there. This is one of those images. After departing Half Moon Bay, I was driving up through dense fog on CA92, when suddenly the fog cleared. 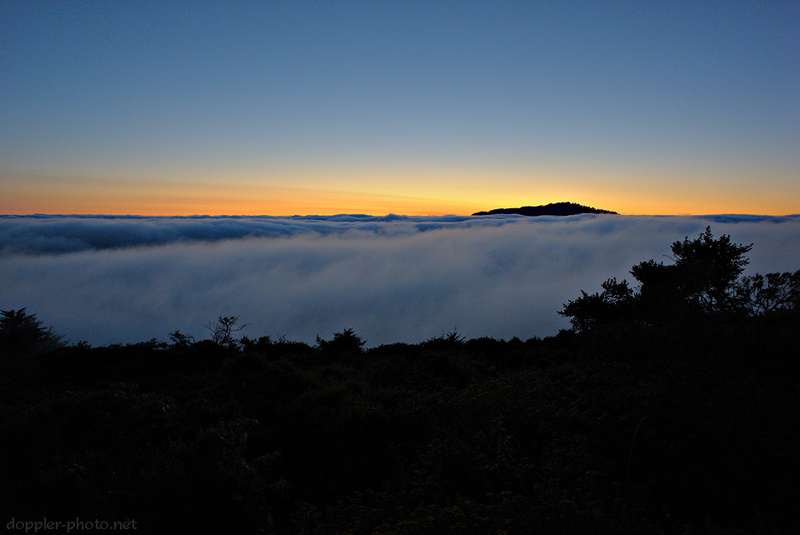 At the ridgeline, I turned south along Skyline Boulevard and was immediately stunned by the scene to the west. It was just dim fog from below, but what I saw from above was an undulating mass of clouds, stretching as far as the eye could see. But even more, as I stood there watching, the fog was slowly rising toward me, sloshing around like the water in an occupied bathtub. It was such a unique, unforgettable feeling, to simultaneously experience the tranquility of a beautiful sunset alongside the the excitement of a gigantic wave of moisture rising to wash over you and engulf you completely. It's like nothing I've ever experienced before. Yet somehow, I managed to capture that mix of emotions. Perched precariously atop a guard-rail, I was able to peek over the looming, advancing clouds in the foreground to also capture a glimpse of the still-turbulent mass in the midground, all beneath a beautiful, tranquil sunset in the distance. A shadowy hint of the California shrubs and wildflowers that populate the mountain keep the image firmly anchored in reality.